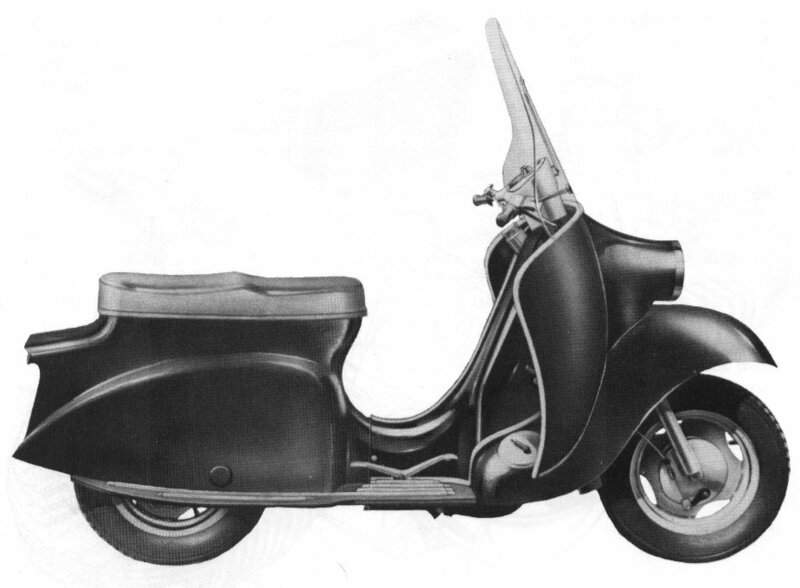 The Viceroy was a Velocette idea of what a scooter should be. They had scant regard for the small wheels, under-damped suspension, doubtful handling, rearward weight distribution and chrome frills and fancies common to most. So they set out to build a machine with scooter style weather protection, a decent size engine to haul the panelling along and, most of all, handling in the Velocette tradition. The design of the Viceroy began with the engine position which they insisted had to be well forward to maintain a good weight distribution. A flat twin was chosen to keep vibration to a minimum and also because it helped to keep the weight low and forward. Capacity was 250cc and two stroke with petroil feed to give the required performance and simplicity, low cost and kept the width down. The engine was based on dimensions of 54 x 54mm so its capacity was 247cc. The flat twin cylinders moved together thus both firing at the same time that sounded like a single. 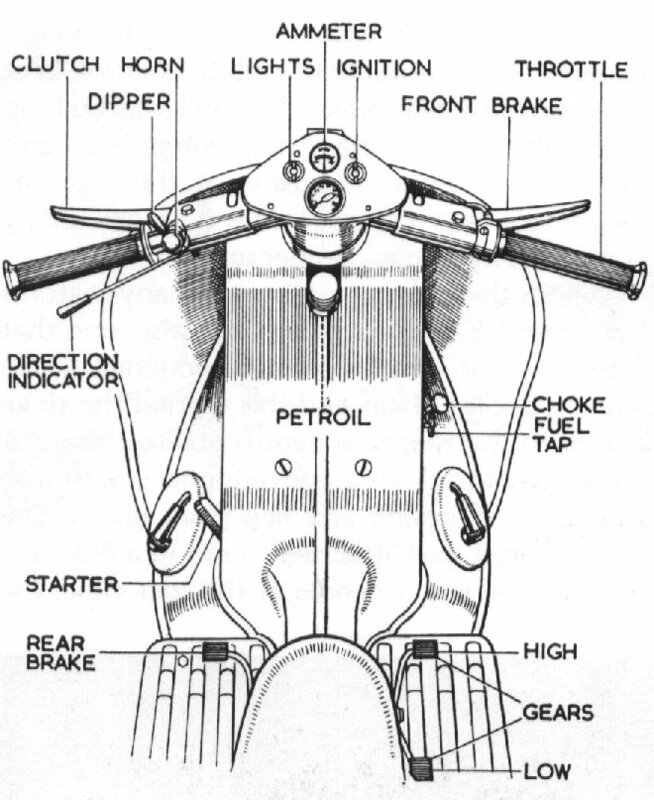 The engine breathed through a pair of reed valves mounted on top of the crankcase which kept the carburettor in the centre out of the way and simplified the cylinder casing. The two exhaust pipes ran back to a silencer mounted low down on the left of the machine where unfortunately it got in the way of removing the rear wheel! On the front of the crankcase went a Lucas RM15 alternator and contact points with automatic advance mechanism. At the rear of the crankshaft went a flywheel and this was cut with gear teeth for a starter. This was a car type electric motor mounted on top of the crankcase. It was of the pre-engaged type where the operating lever first moved the drive gear into mesh. From the back of the flywheel the power was taken by a short propeller shaft to the transmission unit. This unit was built up from light alloy castings and pivoted as an arm from two well spaced bushes at the front. Its movement was controlled by a single Girling spring and hydraulic damper unit. The gearbox contained four speeds and was in essence that of the later LE and Valiant laid on its side. The gears and their selectors were exactly the same and the positive stop mechanism went on the side. Gear changing was via a rocking pedal pivoted on the frame. A crown wheel and pinion was at the rear driving the brake on the inboard side of the housing and the speedometer driven by a gear on the right end of the rear axle. 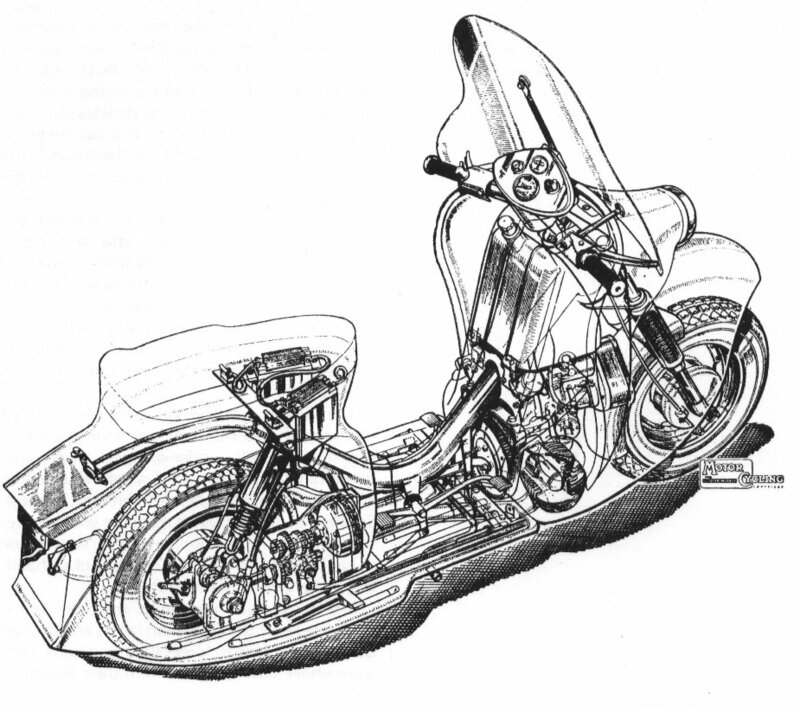 The frame to which this unconventional engine and transmission was attached to was based on a single massive tube which ran down from the headstock and up again beneath the seat. The fuel tank went above the engine just behind the headstock and carried 2.25galls of petroil mixture at 20 to 1. Telescopic forks were fitted to the front to carry a 12 inch wheel and 6 inch brake drum. A similar wheel and brake was fitted to the rear. The working parts were enclosed by a body which comprised six sections and its job was assisted by a front mudguard blade fitted to the forks to keep road dirt off the engine. A large windscreen was fitted as standard. Under the hinged seat was two six volt batteries wired in series. The model was available over its life in various colours starting off in red and white. The Viceroy weighed 302lbs and cost £198.